Together with a group of students we visited the city of Chemnitz for four days. 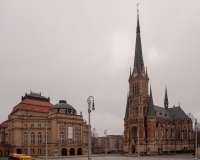 Chemnitz, known as Karl-Marx-Stadt from 1953-1990 in the GDR is the third largest city in Saxony, Germany. Because the city center was bombed down in WW2 and heavily destroyed, the GDR redeveloped it according to the idea of a socialistic modern city. The original plans where however not completed. Today the center is defined by shopping malls next to historic buildings and socialist modern architecture.